When it comes to handheld games I really enjoy, I usually gravitate toward games that allow me to pick up right where I left off. Having not played the first Joe Danger I was unsure what to expect from the sequel and was pleasantly surprised by the outcome. Joe Danger 2: The Movie gave me what I wanted in a handheld game which a quick fun experience, but the developers went above and beyond and packed this game with so much content that it would be a crime not to add it to your Vita collection. JD2 has been around for quite some time now. I remember seeing Joe on the PS3 and PC but it was not until the daredevil made his way to the little screen that I really started paying attention to him. The game task you with the job of a Hollywood stuntman performing in a series of mini-trick courses. You are side-scrolling to the right and it is kind of a mix of Jetpack Joyride and Excitebike. After adding in a wacky-voice commentator that sounds like a host from Wipeout and varying movie-sets, the game really sets a tone of being cartoony-fun. However, do not let the cartoon book and voice fool you because you will be several ‘takes’ until you complete each scene to the director’s satisfaction completely. The main mode of the game is “Movie mode” and this is where the movie-sets are for Joe to show his stuff. All the scenes usually have stars or time limits to complete in order to progress through the movie-sets, but each set also has its unique obstacles in each scene. For example, in Act 4 Dinosaur! you have to crack dinosaur eggs in a scene while racing against the clock. Or in Act 2 Espionage, you are cast as a secret agent and must hit missiles back in the ground before they blast off. Some of the most enjoyable scenes were when there were other racers in the scene that you could punch and knock down. Another aspect that gives JD2 more depth in gameplay is all the transportation options. Some scenes you may be in a jet ski, others flying through the air with a jetpack, and still they have time to cram in skis, bikes and even unicycles. Overall, there is a wide variety of goals and collectables that could keep anyone returning to this game long pass the end credits. This might be a situation of too many things to collect and go back for, especially when some scenes are so infuriating to complete. I envy anyone with a platinum trophy. A nice touch to the game is the ability to do combos throughout every scene in order to fill up your boast and increase your points. Combos are one of the main factors in the game. You have to do them in order to beat time objectives, collect points for stars and in some scenes string a combo from start to finish. Some gripes I have about the game is its ability to occasionally run into some technical hiccups. In the more extensive scenes with car chases or helicopters shooting I had some framerate drops. I will give the devs the benefit of the doubt because most of the time this is one smooth game. Likewise, there are moments in scenes where you just have to remember what is coming up next in order to be prepared to conquer it. I hate having to start over three or even ten times before I get something downright but again the feel of joy when you do complete a scene, more than compensates for the frustrations. I already stressed how much depth and how much time you could spend playing JD2, but really this game is all about replayability. There is the main movie mode, then there are difficult “deleted scenes” or a near impossible “ultra hard preview” mode. Some of these challenges are downright ridiculous and others are just straight up fun. What would a movie be without star power though, and JD2 has some awesome cameos; Sackboy, Iota, Minecraft's Steve, and Valve characters all make a debut and get their Evil Knievel on. 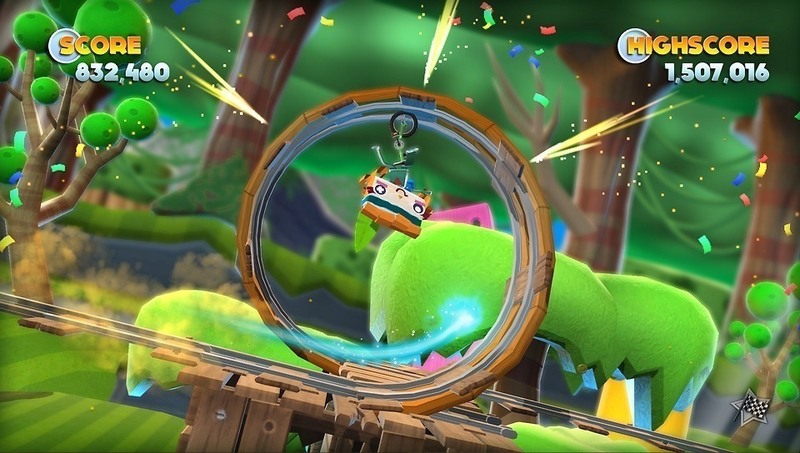 Finally, as if the developers did not add enough themselves they added a creator mode where you can literally make any obstacle course you can imagine. I cannot give this game enough praise. I doubt I would have enjoyed this game as much on the PC or the PS3, but that is because I had such a great time with it while on the go. For your money you receive a plethora of levels, tons of challenges and loads of replayability all on the go. No story, no deep character and easy to remember gameplay did not hold this game back. Joe Danger 2: The Movie has its share of small problems, but the amount of stuff that is in this game and the overall quality will put any doubts to rest. Dragon’s Crown is terrific fun, with the appropriate mindset. It may or may not be distasteful, depending on one’s tolerance for cliches and objectivity, and it may or may not be fun, depending on one’s tolerance for 2-D beat ‘em ups that put the onus of combat potential on the player. However, the strength it has in aesthetic character and gameplay is mighty indeed. Dragon’s Crown doesn’t offer any much needed enrichment of its various genres, but it makes up for this by committing to its visual identity and the frenetic, empowering possibilities of its game design. LEGO Lord of the Rings feels like a refinement of the last portable LEGO game attempt that still doesn’t meet the expectations of the device it’s being played on. As a 3DS game this would work fine but when you port it to the Vita you really expect more and Traveler’s Tales has really failed to deliver recently. I would say if you are looking for a LEGO game on the go then you should probably just keep waiting until they decide to put forth a real effort. If you still want to check this game out then I can only warn you by saying it’s only slightly better than their last attempt and can only hold up because of the source material. With the launch of the PlayStation Vita, developer Team Ninja have seen an opportunity to once again re-release the Sigma version of the game onto the new handheld. At first glance it seems like the ultimate melding of a classic game with new cutting-edge technology, but sadly this port is not without its share of problems.